Two accidents killed nearly 40 people in India on Saturday, including one in which a van full of pilgrims plunged into a river, in the latest deadly crashes on some of the world’s most dangerous roads. Twenty-two people, including seven children, were killed when a van carrying Hindus returning from a pilgrimage to the famous Tirupati-Tirumala temple in southeastern Andhra Pradesh state lost control on a bridge. “The vehicle hit a railing, which broke under the impact of the collision, and fell off the bridge,” a senior state administrator Arun Kumar told the Press Trust of India (PTI). 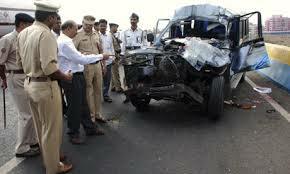 “It’s purely (a case of) negligent and rash driving. It was not a vulnerable point of the road and neither was there any traffic,” the officer said. Andhra Pradesh Chief Minister N. Chandrababu Naidu expressed his grief on Twitter and promised that authorities were “providing all help possible”. Prime Minister Narendra Modi followed suit and conveyed his condolences on the micro-blogging site, calling the incident “saddening and unfortunate”. A head-on collision between a truck and two tractors carrying dozens heading to a prayer ceremony killed another 17 people, including five children, in northern Uttar Pradesh state, PTI cited senior state official Amit Gupta as saying. The crash, which left 30 others injured, sparked anger among local residents who blocked roads and pelted stones at police near Harchandpur, some 60 kilometres (40 miles) from state capital Lucknow. India has some of the world’s deadliest roads, with more than 200,000 fatalities annually, according to the World Health Organization.